The Center for Western Priorities (CWP) released a report last week estimating that the Western states receive more than 290 million visitors each year; that’s more than the amount of people who visited zoos and aquariums, watched the Super Bowl, or attended every NFL, NBA and MLB game combined last season. The report, 290 Million Reasons to Invest in America’s Public Lands, analyzed the total annual visitation to 11 Western states: Arizona, California, Colorado, Idaho, Montana, Nevada, New Mexico, Oregon, Utah, Washington, and Wyoming. 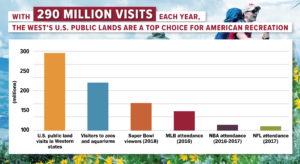 The report analyzed visitation to all types of public land that are managed by the four land management agencies in the U.S.: National Park Service, U.S. Fish and Wildlife Service, Bureau of Land Management, and U.S. Forest Service. 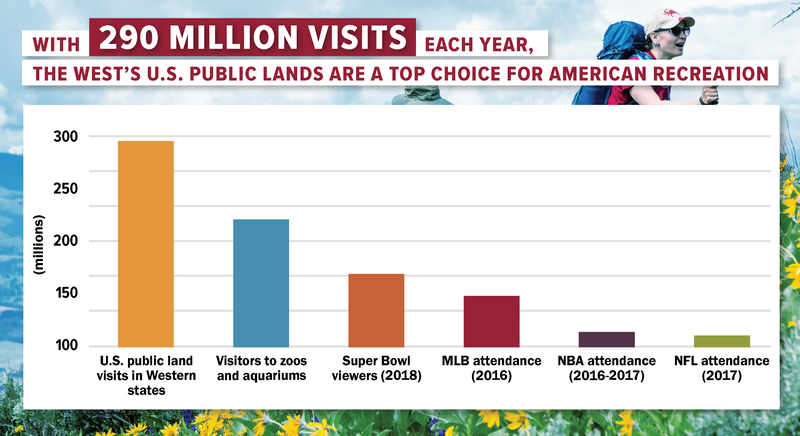 The report clearly demonstrates the growth in popularity for our nation’s public lands. For example, it showed that national park visits in the 11 states surveyed have increased from 81 million in 2006 to more than 108 million in 2017. National monument visits have also nearly tripled since 2000. Public lands also bring economic growth and prosperity to communities around the nation. The outdoor recreation industry is an $887 billion industry that supports 7.6 million jobs nationwide, and is completely reliant on public lands and other shared open spaces to sustain the industry. The positive economic impact of public lands is especially prominent in the west, where public land is plentiful. The report also analyzed the budgets of the four land management agencies as a percentage of the overall federal budget. It found that, by this measure, funding for all four agencies has been in decline since 2000. Additionally, the percentage of the federal budget dedicated to conservation has declined by a half since 1977 (from 2.2 percent to 1.1 percent). As outdoor recreation continues to grow, it’s important to demonstrate the popularity of America’s public lands, which help sustain local economies and provide quality of life for residents, visitors, and help businesses recruit and retain employees. Reports like CWP’s are a great tool to help show that visitation to public lands are only growing, and communities, agencies, policymakers must be ready to continue to deal with this growth in order to maximize the benefits of public lands.